How often do you discover software that you love, but are required to pay for it? Some software makers provide demo versions, allowing you to try the product for a limited amount of time before buying it. Some people opt to continually uninstall and reinstall software to try and outwit the software company. Though this method sometimes works, it’s time consuming. We’re going to provide a way for you to keep the demo without ever uninstalling a product. TimeStopper does that. TimeStopper is a small software which just stops the time of any executable software file and will helps you use that trial software continuously without any trouble. It has a very simple user interface, making it very easy to handle. Browse the executable file (.exe file) of the required software, usually located in C:Program filesAPPLICATION-NAME and now just select the new “installation” date. Extend another 30/60/90 Days depending on the software. 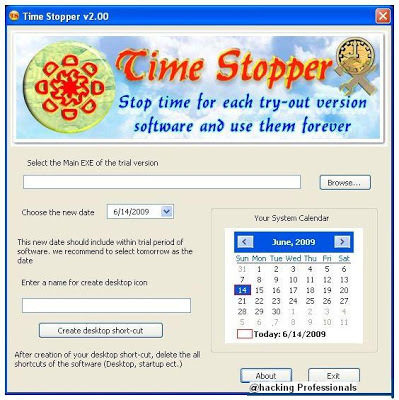 TimeStopper is the software which can stop the time for a demo version of software. When you stop the time, you can use your trial versions forever. Note that this program just extends the trial period of any software by changing the software installation date.